I hadn't walked far from Wannian when I noticed a girl trucking along behind me. She looked in her 20's, hazel eyes, light skin and brown wavy hair. She had on a tank top, green REI zip-off pants favored by American backpackers, and was carrying one of those bamboo sticks the locals sold to tourists for 30 cents. She caught up and we started chatting, alone in the forest. She had started the day before from Baguo town, she was walking the whole way. I had cheated by taking a bus up to Wannian, and had even taken the cable car. Hey, I had a bad wheel and was questioning my intelligence on walking any of the mountain. From her pants and accent I knew she was American. But Camila was born in Chile, grew up in DC, was studying in Beijing and was fluent in Spanish and Mandarin. Perhaps most interesting in such an interesting person was that she was full of goodies on Chinese culture. I listened with fascination to her theories on why the Chinese seemed to be so rude and distrustful, even with one another. She believed that the Cultural Revolution and state control had not only eroded trust in the government, but it encouraged people to lie to each other! They were forced to protect themselves from getting in trouble with the corrupt Communist Party, which was always looking for anything suspicious to extort money from people or throw them in jail. I thought of Saddam Hussein Iraq or Nazi Germany, where the government had instilled such fear in the populace that they turned in their own family members to protect themselves. Anyone that was considered an intellectual was forced to work on farms, schools were shuttered, and illiteracy skyrocketed to 40% in some provinces. Slogans that said things like "Your parents love you, but not as much as Chairman Mao" broke up trust between children and their families and teachers. And perhaps worst of all, religion had been completely dismantled during these years. Temples and monastaries had been burned to the ground; the very foundation upon which familes had grown up, married, and honored their dead had been destroyed. Imams in the west were paraded around town covered in paint, over 6000 monastaries were leveled in Tibet. Estimates of those killed range in the hundreds of thousand to the millions. No wonder Chinese seemed to worship in such a superficial manner! No wonder it seemed to be a country of every man, woman, and child out for themselves. With no organized religion allowed, and no access to the Western world of secular philosophy, the cult of money filled the void. Making money became an obsession, it was how one demonstrated success and proved they were favored and lucky. Even today, when a Chinese person prays at a multi-armed statue, each of the arms grants fortune for a different material object, such as a house, a car, or job. Happy New Year in Chinese literally translates as "Congratulations and Be Prosperous", and the Chinese hand each other red envelopes full of money to ward off evil spirits. Chinese have been brainwashed to such an extent that they believe that if something is good, it must be Chinese. China, after all, translates to "Center Country" in Mandarin. There is nothing funnier than the example of Kentucky Fried Chicken, now called KFC. KFC is endemic in China, they love it. But Camila had met a few Chinese who believed KFC was Chinese. (To be fair, that Colonel does squint his eyes a bit and he rocks a Confucian goatee.) They assumed that if they like something, and it was successful, it must be a Chinese creation. When Camila tried to explain that the K stood for Kentucky, the Chinese would always shake their head and cluck, which is the way an older person tells a younger person that they just don't understand the world. And it all makes sense, really. If one only believes that Chinese things are good and correct, one will never feel the need to look closely at the outside. Or to look at one's country in a critical light, as a place that might have flaws. And most importantly, it makes it more difficult for one to question the integrity of government. Now today, things are obviously changing, and they are changing fast. The ban on religion has been lifted, monastaries and temples have largely been rebuilt. But the biggest change has been the exploding economy. Building wealth for the people has long been Commandment #1 of the State. They learned a huge lesson from Soviet Russia: as long as the economy runs and people must feel their lives are improving, they will put up with any abuse of power. So, the State buys up oil from any dictator it can find, razes the forests, pollutes the air with soot, all to keep the big red engine trucking. Everything the Party does is a frantic effort to keep a lid on the boiling pot. Its all about an overwhelming paranoia that they will lose control. In China, its still 1984. But ... the pot is already starting to simmer. Wealth, ironically, tends to create something called luxury time. Which means people can afford to read, to start to think for themselves, to ask a new question: "Why?" Students can now afford to go to University in droves. Chinese have the ability to travel outside the Zone of Control to other countries, in larger and larger numbers. And travel has a funny effect on people: it tends to unlock their minds. Camila recommended what she called an absolutely essential book if one wants to truly understand the Chinese universe. 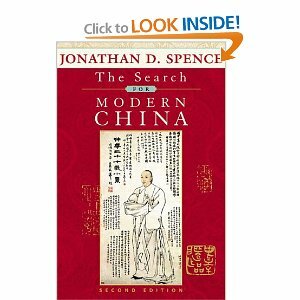 Its called The Search for Modern China by Jonathan Spence. My view on China had been flipped on its head. My initial reaction had been that they were just xenophobic narcissists. But now I saw them more as victims. The Chinese people had been systematically abused by a dictatorship just like the Germans and Russians before them, and it had made the people cold (although don't tell that to a German at Oktoberfest). I wondered what China was like before Mao, if perhaps people had trusted each other a bit more. It was unfair to compare them to the Japanese, really. The Chinese had never known democracy, freedom of the press, "inalienable" human rights. It turned out Camila was a philosophy major, and I mentioned the philosophy book I had just finished. We walked, we talked about Hume and Heidegger and Kierkegaard, how impressive some of their ideas were about Good Government and the Right Way to Live. And I wondered, in a land where much of Wikipedia is banned, if any among the Chinese Flood below had heard of these men. But then again, the pot is starting to boil. Perhaps in modern China, its only a matter of time.